Producer of semiconductor, metal and oxide nanomaterials. Development and commercialization of production technologies for nanomaterials in the pharmaceutical, electronics and chemical sectors. The company Mo6 was formed with the aim to commercialize synthesis of transition metal chalcogenide (TMC) nanomaterials and develop new applications based on this important new class of nanomaterials. An advanced materials company whose platform technology is capable of producing engineered high performance advanced materials, including nanocomposites and nanomaterials, for applications in the environmental and energy industries. Develops nanostructured materials using high-throughput combinatorial electrochemical methods. Pioneers high-efficiency nanomaterials deposition technologies for the production of different types of electrodes and other structural materials in several milliseconds. One of Europes leading nanotechnology companies, developing both applications and materials solutions for an international client base. Manufactures coating materials that offer increased durability and corrosion resistance by the incorporation and use of the nanomaterials. Manufacturer and supplier of specialized nano materials and ceramics. Composites, Catalysts, Bio-medical, Microelectronic and Aerospace applications. Specializes in the production of nanomaterials (nanoparticles and nanopowders) having complex composition and exacting particle size and particle size distribution and tailored surface characteristics. A nanomaterials company set up by a team from Oxford University to develop nanocrystalline materials for commercial use, such as nanoparticle phosphors for flat screen displays, catalysts, chemical reactants, and quantum dots. A nanomaterials company that develops and markets proprietary technologies and products that provide novel properties to a variety of materials such as industrial polymers, plastics and composites. Core product: Halloysite nanotubes. NanoGram develop and commercialize new nanoscale materials for optical, electronic and energy storage applications and products : nanomaterials synthesis, laser process, LDR, RMS, manufacturing. Engineered nanomaterials for emissions control. Producer of nanoparticles for various applications across industries. Focused on development, manufacture and application of nanomaterials and adhesives. Develops and supplies custom nanomaterials to both industry and researchers. Provides nanomaterials and analytical services to meet both university and industrial research needs. Producer of various nanomaterials such as particles, fibers and carbon nanotubes. Manufacturer of single-walled carbon nanotubes at kilogram scale. Manufactures a range of nanomaterials such as powders, coatings, polymers, colloids or resins. Manufactures engineered nanomaterials in the following areas: nanopowders, thin film coatings, and devices. Manufactures a wide variety of nanomaterials including ceramics, metals, alloys, polymers and their composites. Develops and commercializes core-shell nanostructures and nanomaterials for solar cell applications. Produces carbon nanomaterials such as nanotubes and fullerenes, including fullerene-enclosed metal atoms. R&D on conductive polymers, nanomaterials and nanocomposites for electronic and electrochemical applications, including sensors and power sources. A joint venture between DuPont and Air Products, develops and manufactures colloidal silica sols and particles for electronic applications. Develops a template manufacturing proces that utilizes technologies adopted from the microelectronics industry for the fabrication of engineered shape and size-specific nanomaterials. A supplier of nanomaterials including carbon nanotubes and nano oxides (rare earth, metal, and non-metal). If the business hours of Meliorum Technologies in may vary on holidays like Valentine’s Day, Washington’s Birthday, St. Patrick’s Day, Easter, Easter eve and Mother’s day. We display standard opening hours and price ranges in our profile site. We recommend to check out meliorum.com/ for further information. 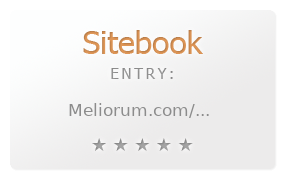 You can also search for Alternatives for meliorum.com/ on our Review Site Sitebook.org All trademarks are the property of their respective owners. If we should delete this entry, please send us a short E-Mail.